Between January 2012 and June 2013, the Supreme Court unanimously rejected the Justice Department’s extreme positions 9 times. The cases ranged from criminal procedure to property rights, religious liberty to immigration, securities regulation to tax law. They had nothing in common other than the government’s view that federal power is virtually unlimited. As a comparison, in the entire Bush and Clinton presidencies, the government suffered 15 and 23 unanimous rulings, respectively over eight years. 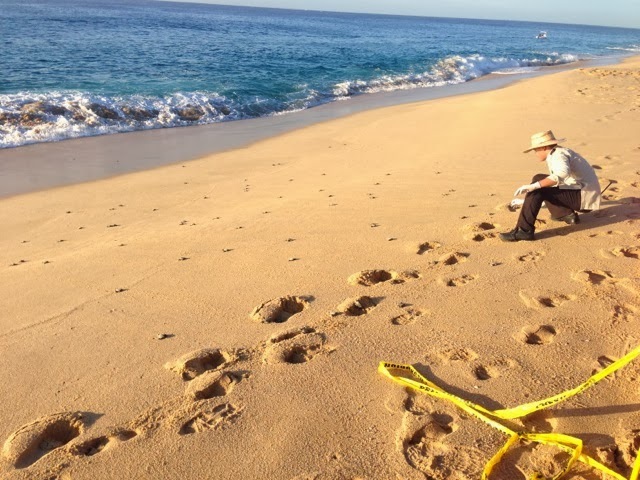 During our recent sojourn in Cabo San Lucas, BCS, Mexico, we saw baby sea turtles hatch almost every day! In our past five visits we have seen two mass hatches and the march to the sea. LINK But this trip surpassed all five previous ones. On our first morning's sunrise walk we saw a group of people standing on the upper beach at the Solmar Beach Resort - the original Solmar resort. Sure enough a nest of eggs had hatched. A typical nest contains 85 to 110 eggs. They usually hatch just before sunrise. Resort employees (security employees are trained to watch for and handle the turtle hachings) gathered the hatchling turtles and stored them for release late. They choose a time when airborne predators are least likely to attack - sunrise or sunset. So we returned at sunset for the release. But, unfortunately the resort policy changed. 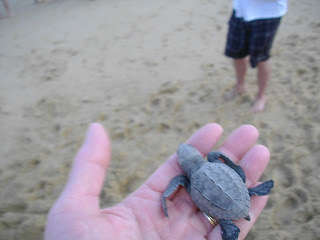 In past years we were allowed to each take one turtle and launch him/her. Each one had a name! But this year they put up yellow police tape and wouldn't let us be involved. 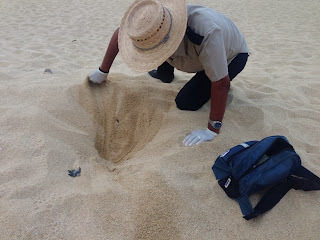 The next day we saw a mass hatch at Playa Grande a couple hundred yards down the beach. Both these resorts face the Pacific Ocean; most Los Cabos resorts - both Cabo San Lucas and San Jose del Cabo - face the Sea of Cortez. The fourth of our first five days there we again saw wandering tracks. This time a resort employee was there. He looked around, then where the tracks were densest he put on gloves (¿Porque tienes guantes?) He dug in the sand and about 8 inches down found a turtle. It didn't move at first, but then he did. 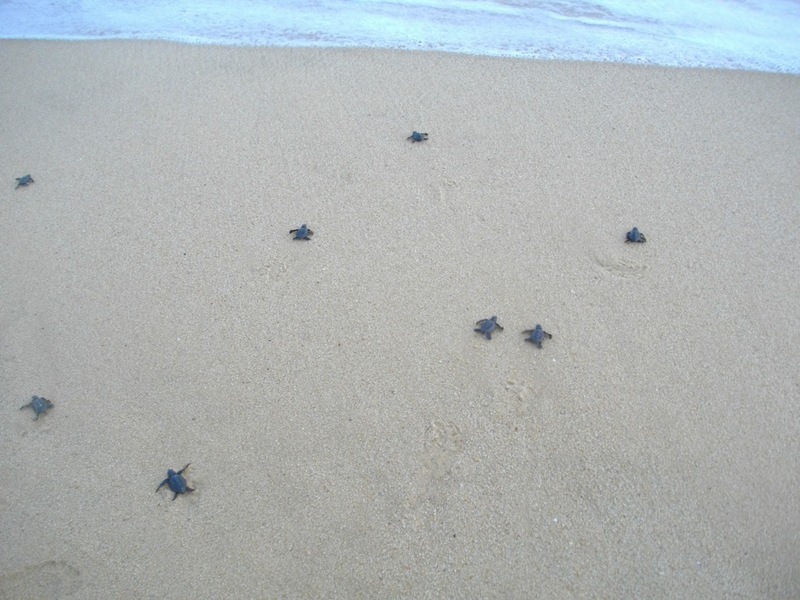 Hatches in unknown spots usually don't happen because when the mothers lay the eggs the resort marks where they are. And usually they move them to a common area to avoid disturbance. One year we saw an adult sea turtle cross the very wide beach to the buildings. But we didn't check to see if it was a mother laying eggs; probably was. Photos: My photos. First two are 2011 at Solmar Beach Resort, Cabo San Lucas, BCS, Mexico. The rest are at Playa Grande in 2013. Adult is Playa Grande in 2010. Has President Barak Obama violated the US Constitution? Yes!! Let's count the ways. Mini-DREAM Act. Congress has shamelessly failed to pass any sort of immigration reform, including for the most sympathetic victims of the current non-system, young people who were brought into the country illegally as children. Nonetheless, President Obama, contradicting his own previous statements claiming to lack authority, directed the Department of Homeland Security to issue work and residence permits to the so-called Dreamers. The executive branch undoubtedly has discretion regarding enforcement priorities, but granting de facto green cards goes beyond a decision to defer deportation in certain cases. Via Allah at Hot Air. Senator Tom Coburn (R, OK) provides a helpful focus on wasteful spending in the US government. He just released his annual Wastebook. … 3. $17.5 million in brothel tax exemptions: Coburn says that through the tax code, $17.5 million has gone to brothels in Nevada that have claimed tax exemptions for everything from breast implants to “free passes” that were deemed part of promotional costs and eligible for deductions by the IRS. 4. $50 million “Google searches”: Coburn attributes $50 million to National Technical Information Services, an agency that charges for reports that often can be found for free through a Google search. Coburn calls NTIS, which is part of the Department of Commerce, antiquated, as it was created at a time when information wasn’t as readily available. He noted that about 74 percent of its reports had information available in public sources. Additionally, a CD-ROM for which the agency charges $79 contains information that is also available for free on the Internet. … 7. $285,000 for rock ’n’ roll : For the first time, the federal government’s “trade arm” funded the music industry as the American Association of Independent Music received $284,300 this year from the International Trade Administration. The funding allowed 12 music label executives — joined by one government official — to travel to Rio to promote music in foreign markets. Coburn, calling it the “the Indie Rock Music Execs World Tour,” says the group also had a side trip to Sugarloaf Mountain. The only person to escape from a maximum-security slave labor camp in North Korea asks Dennis Rodman to think about the slaves suffering today. Shin Dong-hyuk was born in Camp 14 in 1982. He knew nothing of life outside the camp - and of torture and killing on whim inside - until a high-level detainee was assigned to work with him. Shin's offense wash his father's brother escaping North Korea 25 years before he was born. The detainee told him of life outside and planned for both to escape. The electric wire surrounding the camp is designed, not to turn one back, but to kill. And it did kill the other detainee, but Shin climbed through over his body and got to China, then South Korea, then the US. His story is told in Escape from Camp 14 by Blaine Harden. Today Shin asks Dennis Rodman to look up Camp 14 on his phone to see it does exists. And to think about the slaves being starved and tortured there while he is partying with the dictator and his chosen few. Unfunded pension liabilities have Puerto Rico near the edge and Detroit going over. Illinois is close and California has liabilities. Fox News has a new news center bringing all the pension news into one place. Ukraine, a former "republic" in the USSR, has been on the edge between the opportunities and risks of close relations with Europe versus the bear hug of Russia's emerging new empire. Ukraine's President Yanukovich chose Russia. But huge crowds have been filling the streets in protest. So President-ex-President Vladimir Putin answered the charge of favoritism by granting favors. He announced this week a huge discount on natural gas with assured supply and loans of several billion $. Along with the benefits in energy and finance they got the overlordship of V Putin. He will treat Ukraine with all the respect given to every Soviet republic from 1918 to 1991 and the East Europe vassals from 1945 to 1989. That is none at all. When you ride the tiger you go very fast. But you can't get off. You don't dare try. Washington's Obamacare system debited peoples bank accounts early. Would you like an $835 payment to hit two weeks early? Gov. Jay Inslees team did it. There has never been a better time to be alive than now. By most measures everyone is better off than ten years ago. Than 100 years ago. Cato has a new web site following the trends. "If you like your healthcare plan you will be able to keep your healthcare plan. Period." Watching the cancellations climb into the millions - and more next year - that statement has been proven false. A lie. How many time did President Obama or his White House spokespeople say it? PolitiFact has collected 37 instances from June, 2009 to September 26, 2013.